New Yorkers and fellow music lovers, are you going down to SXSW? Well, if you are, our very own resident soul mama, Caitlin Krisko along with her band The Broadcast will be there! 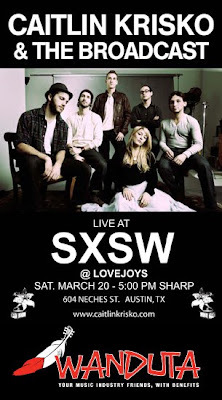 They'll be at Lovejoys on Saturday, March 20. Head on over and check them out if you're down there. She puts on a fun show. Oh, and if you haven't already checked it out, give her record Over The Undercover a spin.